The buzz in Charleston the next couple of days will be the thousands of students returning to campus as move in-day at EIU begins on Thursday. Traffic will come to a stand still and grocery aisles at Wal-Mart will be empty but all are signs that fall is just around the corner. Men's soccer began its fall today as the Panthers played an exhibition match against Saint Xavier College out of Chicago. EIU fell in the match 2-0, but it gave head coach Adam Howarth a good feel for where his team is current at. EIU women's soccer will kick off the regular season for all Panther sports teams when they host IUPUI on Friday at 4 p.m. Other teams currently back on campus are cross country, women's rugby, volleyball and football. Look for the OVC cross country poll coming out on Thursday, the Panthers should be right in the mix. As for football the Panthers will hold a situational scrimmage at 3 p.m. on Thursday as they begin to prepare for their season opener at Iowa in just 17 days. 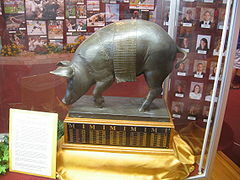 Speaking of Iowa we started looking at the games the play against opponents for a trophy. One of the more famous has to be the Floyd of Rosedale battle with Minnesota voted the No. 1 trophy game by Rivals.com in 2008. Trophy games truly are a great aspect of college football.